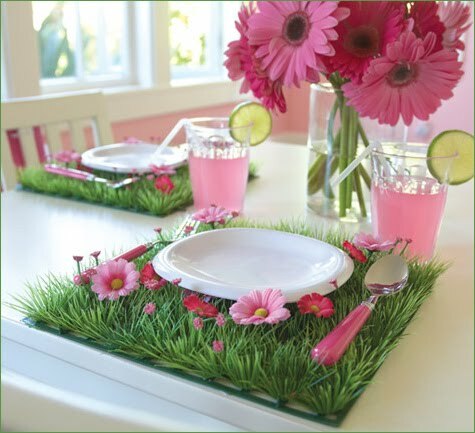 While I was looking at some party ideas, I came across this adorable grass mat. I simply must have this! See more gorgeous goodies here. Where are your favorite places to buy party goodies online? I love finding new etsy sellers and would love to hear your recommendations. Fingers crossed that they get more!! pink parties are the best! I can't wait to see what you carry out! I saw this a couple of years ago - thanks for reminding me! I might just have to do this for an easter bunny brunch! That is so cute!! Unfortunately I'm far away from having any kids yet, but that's something I'd buy and store away. So precious! That placemat would also look good as a Springtime centerpiece. I made coasters for a Super Bowl party by cutting the faux grass rolls from Home Depot into circles. The placemats remind me of them.